Xwe’chi’eXen is a sacred landscape in northwestern Washington that has deep spiritual and cultural significance to the people of the Lummi Nation. This sacred site is now known as Cherry Point. Xwe’chi’eXen is an ancient reef-net site and a 3,500 year-old village site. Lummi Nation’s hereditary Chief, Tsilixw, also known as Bill James, describes it as the “home of the Ancient Ones.” It was the first site in Washington State to be listed on the Washington Heritage Register, and is eligible for the National Register of Historic Places. Lummi tribal member and documentary filmmaker Freddie Lane said in an interview, “The spiritual importance of this land makes this place much more than just a space” (Lane). Cherry Point has been the proposed site of the Gateway Pacific Terminal dock, which would be built precisely on the Xwe’chi’exen village. This proposal would haul an estimated 55 million tons of coal from the Powder River Coal Basin of Wyoming and Montana (See Powder River Basin), to the terminal just north of Bellingham, Washington. These long, heavy rail cars would travel through Montana, Idaho, eastern Washington, and up the Columbia River Gorge to the Washington coast (See Coal Trains). In 2009 a representative of Burlington Northern Santa Fe Railway Company testified before a federal review board that 645 pounds of dust escapes from each coal train car during a 400-mile trip. This project has been very controversial in the community and put Natives at odds with many non-Natives in the immediate area. Xwe’chi’exen is a village that some say is more than 175 generations old, going back more than 3,500 years. According to Freddie Lane, “It is more than just fishing rights the tribe is worried about. Xwe’chi’exen is home of ancient and sacred burial grounds; where chiefs, warriors, mothers and grandmothers are buried” (Lane). The Stevedoring Services of America now (SSA) Marine Corporation is exploring different avenues to pressure the Lummi Nation to negotiate an agreement but have not been successful thus far. The Lummi Nation remains steadfastly unwilling to compromise at any cost. The creation of jobs in the local economy is the coal industry’s selling point for most fenceline communities, but this tactic does not work for the Lummi Nation. An estimated 400-plus tankers would be coming and going from Xwe’chi’exen, eliminating tribal members’ ability to fish, crab, and practice other cultural life ways that are guaranteed to them by the 1855 Elliott Point Treaty. There remains a wide divide between the tribe and SSA Marine Corp. when it comes to the economic impacts and the number and types of jobs that would be created. The SSA Marine Corp. said that this project will create over 400 permanent jobs and bring millions of dollars into the economy. Many of the Lummi tribal members disagreed, stating that it would only be creating boom-and-bust jobs that will not last. Freddie Lane said, “When the money is gone and the industry has damaged the land or polluted the water, most people can move away but the Lummi Nation will still be here, this is our home” (Lane). The Point Elliott Treaty of 1855 ceded most Lummi land but allowed the Lummi people to stay on the reservation and continued access to “usual and accustomed” fishing and hunting sites. According to Article Six of the Constitution: “This Constitution, and the laws of the United States which shall be made in pursuance thereof; and all treaties made, or which shall be made, under the authority of the United States, shall be the supreme law of the land; and the judges in every state shall be bound thereby, anything in the Constitution or laws of any State to the contrary notwithstanding.” This statement is one basis for Native nations to defend their treaty rights. Lummi elders have passed on the importance of understanding their treaty rights and exercising them in defense of future generations, as part of their legacy that they leave behind. The Lummi Nation has a culture that cannot be separated from the land nor can it be separated from the rivers and the salmon. Many elders state that they have been fishing these rivers since time immemorial. 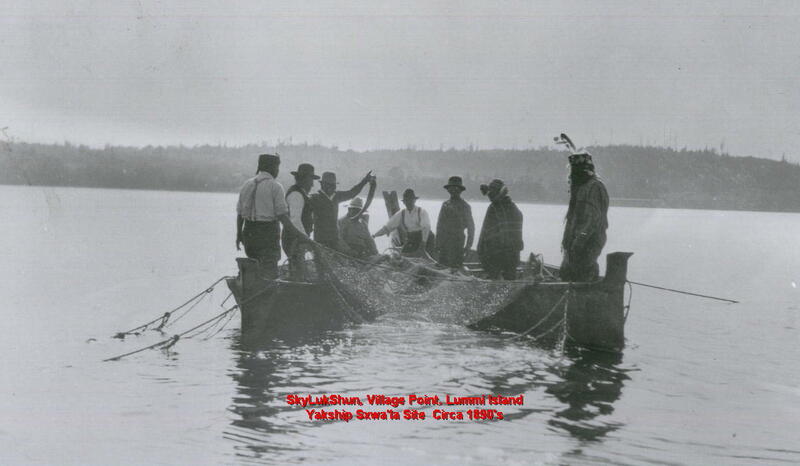 The Coast Salish people of the Salish Sea have held regular ceremonies commemorating the salmon runs, and performed various rituals to ensure the return of the fish, for many centuries. Although they used highly efficient harvesting techniques, including gillnets, weirs, reef nets, and special dams, they acted as stewards of the fishery and always took care not to deplete the main source of their subsistence (Shreve). The ceremonies were a sacred reminder of the need to continue to care for the waters and all the living things inside of her. The idea of Kwel Hoy’, meaning “we draw the line,” came from a speech given by Lummi Councilman Jay Julius when he was discussing the proposed terminal at Cherry Point. Kwel Hoy’ is the opinion of master carver Jewell James. Jewel James has been traveling along the routes of the proposed coal terminal sites and train routes. He has been carving totem poles and creating awareness about the environmental degradation caused by coal. So by putting these totem poles in proposed sites, they stand as spiritual protectors, capture people’s imagination, and build solidity along the rail route (Totem Pole Journey). This is a spiritual and cultural act of resistance to these coal industry. The fossil fuel industry has and continues to cause many hardships in Native territories around the nation. Along with the money comes squabbling, drugs, and violence--the types of negative social impacts that the Lummi people fear. The youth have traveled around the state and recently to Washington, D.C. to speak up about the proposed terminal on their land. The youth and canoe family joined with thousands of protesters in the Paris climate talks to protest, dance, sing and screen a film from the Lummi Nation called The Earth is Alive. Lummi Nation Council symbolically burns a $1 million check from the terminal company (Credit: Blades). House lawmakers led by Rep. Ryan Zinke, R-Mont., voted to keep the permitting process going for the Gateway Pacific Terminal near Bellingham, Wash. The Lummi Nation, which has fishing waters next to Cherry Point, had asked the U.S. Army Corps of Engineers to abandon its review of the port proposal. The Lummi argued that its treaty rights would be violated by the terminal. However, Montana’s Crow Tribe made a counter argument that its treaty rights to profit from coal mined on land in the southeastern part of the state were in danger if the port plans were killed. The Crow have coal to ship and a stake in the Gateway Pacific Terminal. Groups such as the Alliance for Northwest Jobs and Exports, who are strongly supporting the SSA Marine project claiming that if the site is not built in Bellingham it will just be built somewhere else. On the other hand, the Lummi Nation was very hopeful that the federal government would side with the rights they maintained in the 1855 treaty. In May 2016, the U.S. Army Corps of Engineers sided with Lummi, and rejected the terminal permit (Mapes). Tribal memebrs and leaders celebrated the unprecedented victory for treaty rights. Lummi Chairman Tim Ballew III described the victory as “a celebration of treaty rights. But it’s also a celebration of the power of treaty rights to protect all of us, to preserve our lands and waters for everyone who calls this place home” (Ballew). Through the struggle, the Lummi Nation has created a new generation of climate justice activists who will continue to fight for future generations. The continued education and involvement of youth, the totem pole journeys, and the community support is gathering strength and building consciousness through these activities. Many different Indigenous peoples from across the globe are coming together to support each other for a better future for their children and grandchildren. Anderson, P. K. (2013). The Search for Integrity: Lummi history and their view on Gateway Pacific Terminal. Whatcom Watch. Ballew, Tim II (2016, Mar 14). Cherry Point victory shows treaty rights protect us all. Bellingham Herald. Bernton, & Rosenthal (2013, September 3). Demand cools as fight rages over coal-export terminals. Seattle Times. Bernard, Sara (22015, August 28). Lummi Nation is building its case to defend its rights legally. Seattle Weekly. Climate change - Info & action - LWV of Bellingham/Whatcom county. (2016, February 17). Links to many different articles to help understand the issue around proposed coal terminal. The League of Women Voters of Bellingham and Whatcom County. Conklin, Ellis E. (2012, October 18). Lummi Indians to NW coal producers: Don’t Tread on Us: Coal trains and the impacts on Lummi fishing. Seattle Weekly. Dena. (2015, October 4). Coal’s dark alliance defames Lummi nation: Native American Treaty Rights Under Attack: Proposals, political ties and proponents. Felleman, Fred (2012, March 3). BP’s Cherry Point operations: More than a fire investigation is needed. Cross Cut. The Governor’s Office of Indian Affairs. This link has specific language of the treaties. (Article 5 deals with fishing and gathering). Hopper, Frank (2015, October 28). Paddle to Paris: Lummi Youth Canoe Families plan to travel to Paris for COP21. Cascadia Weekly. Lutey, Tom (2015, December 2). House vote stops coastal Indians from blocking port for Montana coal. Billings Gazette. Mapes, Lynda V. (2016, May 9). Tribes prevail, kill proposed coal terminal at Cherry Point. Seattle Times. Paulinbham, & Fuller, M. (2015, August 29). Our shared responsibility. The Spiritual and cultural resistance to coal. The Totem Pole Journey. Quirke, Stephen (2015, September 22). Indigenous struggles against resource extraction are gathering strength in the Pacific Northwest. Earth Island. Schilling, Vincent (2015, November 19). 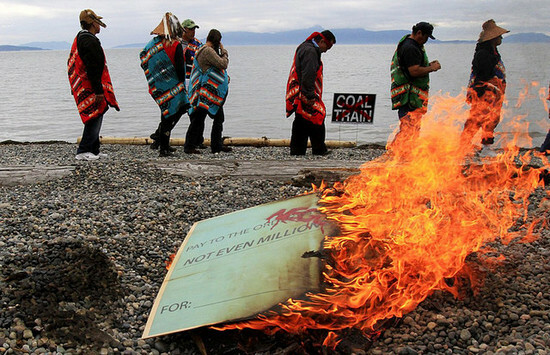 Lummi Tribal Leaders Rally in D.C. Against Nation’s Largest Coal Terminal. Deep Green Resistance News Service. Schwartz, Ralph (2015, January 5). Lummi Nation asks Army Corps to reject Cherry Point coal terminal. Bellingham Herald. Schwartz, Ralph (2015, September 11). Lummi tribe says talk of Cherry Point land grab is a fabrication. Bellingham Herald. Schwartz, Ralph (2015, October 3). Crabbing highlights importance of coal port site to Lummi Nation. Bellingham Herald. Boyle, Todd (2015, November 6). Indigenous Climate Change Summit. Earth Fix Media (2013, May 15). Voices of Coal | The Tribal Fisherman: Jay Julius. Matika, Wilbur (2015, October 19). Stop Coal Exports: Protect Cherry Point. Lane, Freddie (2015, November 5) Film documentarian and Lummi tribal member. Personal interview. Shreve, B. G. (2009). "From time immemorial": The fish-in movement and the rise of intertribal activism: Pacific Historical Review, 78(3), 403-434. DOI. Walker, Richard (2015, February 27). Environmental impact: BNSF representative testified before a federal review board that 645 pounds of dust escapes from each coal train car during a 400-mile trip. Indian Country Today Media Network.